Whooo! You’re saving 28%! Save big by paying annually! Try MailTag for free. No card required. Ready to buy? Your purchase is protected by our unprecedented double-guarantee. If we can’t dramatically increase your sales, we don’t want your money. Receive a full refund at any time within the first 30 days after your purchase for absolutely any reason. Simply email Help@MailTag.io and our team will process your refund within 24 hours. If you don’t double your sales or productivity within the first 6 months of using MailTag, simply email Help@MailTag.io for a full refund within 24 hours. Can MailTag see my emails? Heck no. MailTag has no insight into any of your emails or browser's web history. Nor do we have any insight into any information located on your MailTag dashboard. We exclusively communicate with Google servers through Gmail’s API (OAuth), making MailTag more secure than competing Gmail products. 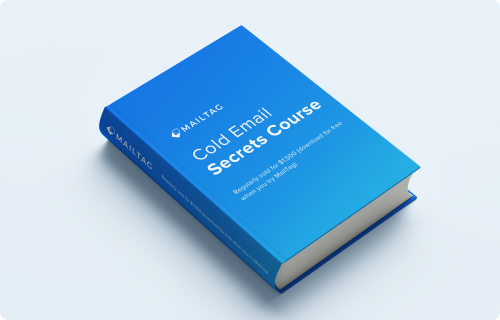 What’s included in the Cold Email Secrets Course? In short, tons of material to skyrocket your sales career. If I upgrade my account, but then want to transfer the subscription to a different email, how can I do this? Simply shoot us an email (Help@MailTag.io) and we’ll get your request processed ASAP. Does MailTag offer bulk discounts? Absolutely! Just email Business@MailTag.io and we will accommodate your team (please note, there is a 5 seat minimum). Email Secrets Course once you begin your free-trial.